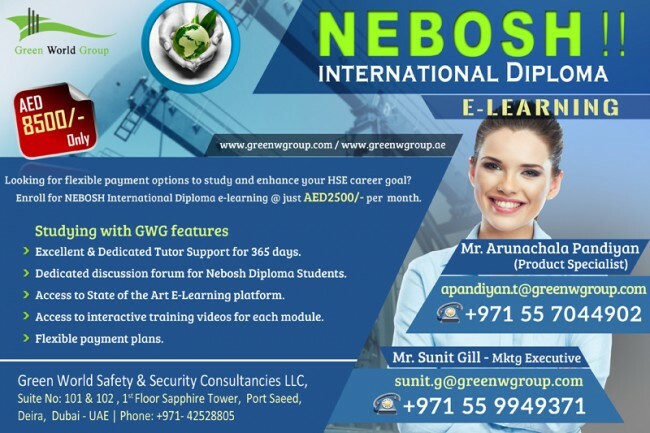 Green World Management is now offered for Nebosh International Diploma course in Dubai by e-learning just only AED 2500/- per month. Green world Management is the world leading educational safety consultant & training institute and conducting the Nebosh IGC training courses in UAE. Thanks for your enquiry. Our marketing executive will reply to you soon. Thanks for your enquiry. Our Marketing team coordinator will contact you soon. Thanks for your enquiry. Our Marketing executive will contact you soon.! I live in Dubai and I work in Gov. Dep. Thanks for the enquiry. Our Marketing executive will contact you soon. Thanks for the enquiry. Our marketing executive will contact you shortly. Are u giving classes of Nebosh IGC and Diploma in Al Ain? Thanks for the enquiry. Our Marketing coordinator will contact you regarding this. plz tell me what is the procedure and fee.. Thanks for the enquiry. Our Product specialist will contact you soon regarding the course. I am looking for NEBOSH Int. Diploma in offer price, may I know when your offer price will start. hi i did NEBOSH from GWG and now i want to apply for NEBOSH International Diploma soo can you please tell me how much it will cost. I am zubair from fujairah, I am interested in NEBOSH Diploma, please guide about fee and duration, currently working as safety officer. Thanks for contact us. we will send a mail shortly.